Ingredients: If you liked the intense character focus of X-Men: First Class, the action and effects of Hancock, and the plot of The Craft, you will like this movie. 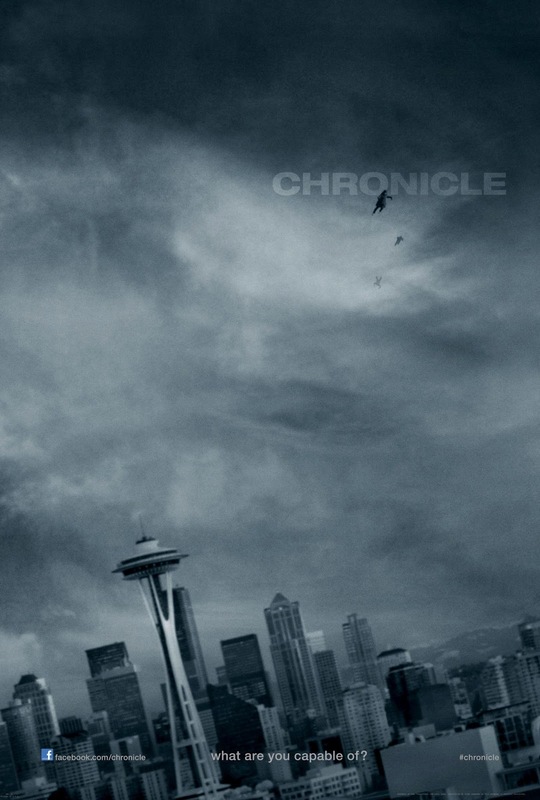 Let me start by saying Chronicle nailed it. Updating the ‘found footage’ genre to include actual cinematography while still staying in the logic of the film, Chronicle nailed it. A realistic approach to a modern age superhero story that is both exciting and emotional, Chronicle nailed it. Examining the teenage/high school mentality without being condescending or annoying, Chronicle nailed it. Now that I’ve raised your expectations, let’s get into why. The film is shot from the camera of Andrew Detmer (as played by Dane DeHaan) as he documents his crappy crappy life and with good reason. Andrew’s home life is abysmal and his school life is even worse. Andrew’s only friend is his cousin Matt Garetty (Alex Russell) and is only barely acquainted with Steve Montgomery (Michael B. Jordan.) The three couldn’t be more different in personality: Andrew is the misunderstood shy outcast, Matt is the fun loving egotistic with a good heart, and Steve is a popular all-star jock with political aspirations. But the characters work extremely well together; the dialogue and the actions will just pull you right into the film from the get-go. Eventually the three find a mysterious object underground that gives them intense headaches and nosebleeds before the camera goes black. When Andrew starts shooting again, the three are already experimenting with newly developed telekinesis powers. They pull several pranks on the people around them, slowly expanding their mental powers but also growing closer as friends. While there are a few demonstrations of the three misusing their powers, the emphasis is not on the repercussions of their actions but more on the freeing experience of using them. This also begins the classic superhero arc for two of the characters, Andrew and Matt. And while Matt is slowly beginning to understand that his power is also a responsibility, Andrew takes the opposite route. And that’s truly what makes this a different kind of superhero movie. If you’ve seen the trailers for Chronicle, you can already guess where Matt and Andrew will end up. But the story doesn’t revolve around Matt learning to use his powers for others, instead it’s about Andrew learning to use his powers to fix all the things he hates in his life using whatever means necessary. In many ways, this story is told from the supervillain's point of view and the idea that it is not the powers that make the hero or villain, it is the circumstances. And the ‘filming everything’ aspect of the movie is actually an important character development. First, Andrew uses the camera to separate himself from his own life, then uses his powers to separate himself from the world altogether. I have to say, though, I think what I love most about this movie is that it all takes place in Washington state and I, for one, am extremely grateful for any movie that can topple Twilight as a representative of Washington. In all, I hope Chronicle opens up more doors for director, Josh Trank, especially when its clear he can overcome the handicap of using the ‘found footage’ style and still make spectacular visuals. Thumbs up, people! Thumbs way up!